From the first turn of a motorcycle wheel until now, the essence of riding has remained the same. Sure, sure, the motorcycle have gotten faster. They have gotten bigger and more reliable as well. Heck, they even have space-age navigation systems and theatre-quality sound set ups these days it seems. However, at the end of the day, riders still throw a leg over for the same reasons that the pioneers of two-wheel locomotion did oh-so-many years ago. 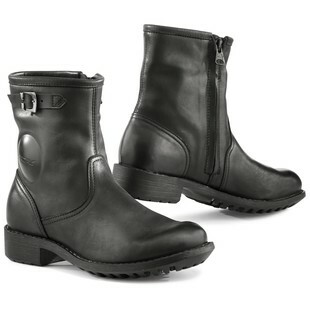 To grasp some of that timeless ethos, TCX has designed the Biker WP Women’s Boots. Standing at the intersection between motorcycle’s roots and the most modern material upgrades in the game, the TCX Biker WP Women’s Boots offer the best of both worlds. From the full-grain leather upper to the convenient zipper entry and polyurethane safety inserts, the coming together of eras is totally seamless when looking at the Women’s Biker Boots. Additional features include a waterproof lining that will keep your feet dry throughout rough weather, reinforced heel / toe counters, and a construction that was crafted on a women-specific last so as to better fit the footbed of female riders. When it comes to timeless style, it is timeless for a reason. Nothing too loud, but nothing that is so quiet as to never cause someone to speak up like “oooohhh, those are some nice kicks!”. Those are the barriers within the BIker WP Boots for women operate, and it is a realm in which they stand out at every turn.